Earlier this week I had one of the interesting rides where it didn’t go as planned but still turned out great. You know, those rides where a “what the hell” moment as you come to some realization that could dramatically impact the ride turns it into an “oh well” moment as you decide to keeping rolling along. It all started when I managed to get to of work a little early one day. I dropped off Thomas (my road bike) at NorCal Bike Sport for some TLC then headed home to ride. My plan was simple. Get home, grab the single speed, ride! The only thing I needed to remember was to grab my seat bag, which has everything I need to deal with flats. Here’s where it gets complicated. The seat bag for the single speed is only big enough for one tube and a few tools. The seat bag for Thomas contains two tubes. Since I took the seat bag off Thomas before dropping him off I decide to take that seat bag. I mean, two tubes are always better than one right? But, the single speed does not have quick release levers for the tires so I better make sure I grab the small wrench I carry as well. As I get home I realized I really should have been paying attention to traffic and not my seat bag strategy but I made it and I’m good to go. I get all kitted up, fill my pockets with phone, food, arm warmers (in case it gets cold), etc. I even remembered the wrench. Then its out to the garage to grab the bike. As I pull it down I immediately notice that it doesn’t have pedals. This was the first “what the hell” moment. Long story short - I moved the pedals to the new cross bike during the winter since I’m still deciding what pedals I want to use. Ok, no worries here. I quickly swap the pedals, pump up the tires and I’m finally ready to ride albeit about 15 minutes later than I was hoping for. The plan called for cruising through Spring Lake and then into Oakmont where I as hoping for about 30 miles of gentle rollers. Now, Spring Lake is surround by a dike and has a few hills, which were fun to take on with the single speed. Just as I was thinking about that, I had my second “what the hell” moment. You guessed it - I forgot the damn seat bag. Now, I have zero tubes so I start thinking of my options. Sherry is in a class so she can’t pick me up. Jeff lives in Oakmont so I could stop at his house and borrow what I need although it would be my luck that he would not be home. Of course, I could just take a chance and keep riding but feels a lot like tempting fate. I ultimately decide to keep riding but to shorten the ride and stay close to home. Now, Oakmont is not longer an option since I don’t want to go that far. I’m already in Spring Lake and having fun climbing over the little hills so I decided to keep at it. To add to the fun, I decided to ride every paved road and path in Spring Lake at least once. Soon, I forgot all about the seat bag and was just have a great time on the bike. 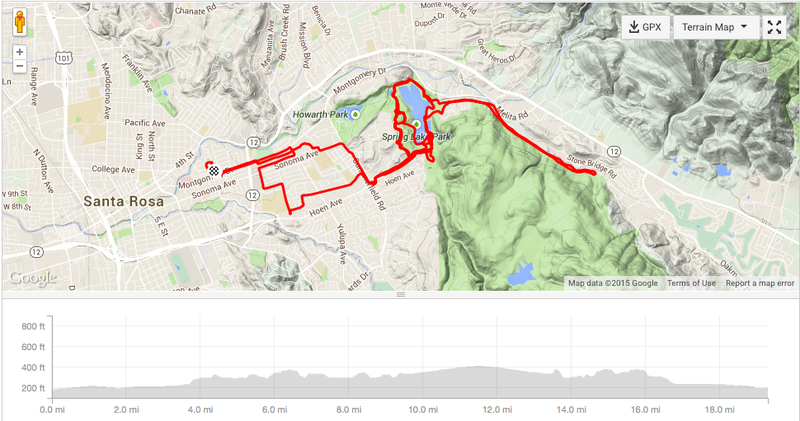 The end result was a decent ride of 19 miles with 800 feet of climbing with one speed and zero flats. It was a great ride on a beautiful spring evening. It was also a great reminder that sometimes the best decision is to look your “what the hell” moments right in the eyes and keep rolling.